Your teen needs an introductory high school writing curriculum that lays a firm foundation for rich creative writing, powerful essays, and carefully crafted research papers. This is a full year downloadable .pdf writing curriculum for the inexperienced writer (9th grade students and others with little or no writing experience). By purchasing this “bundled” etext, you save money and have all of your writing curriculum in one handy file for on-screen use or to print if you prefer. 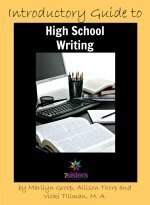 Click here for a review of Introductory Guide to High School Writing. Click here to view an excerpt from Introductory Guide to High School Writing. Lay a firm foundation for Essay Writing in High School. Creativity is necessary for excellence in all writing formats. Once homeschooling high schoolers graduate, they will need to be able to communicate in ways that interest employers, Sunday school classes, ministries, or any other place God puts them. Those who are heading for college will be competing for good grades on papers. If they have creativity in their use of thoughts and words, they can produce papers that are interesting to read (as opposed to 200 other drably-written papers that a professor might read). Homeschoolers can develop confidence in their creativity skills by having some fun with their writing assignments using 7Sisters creative writing high school curriculum guides. Introductory Guide to High School Short Story Writing: Family Narrative is a 23-page downloadable pdf writing guide, written by Vicki Tillman to encourage students to capture their creativity by sharing a family story. Success awaits with this creative writing high school curriculum! Designed for independent learning or for co-ops, homeschoolers will require little or no guidance to complete this creative writing high school curriculum e-text and gain solid creativity skills. Click here to view an excerpt from Introductory Guide to High School Story Writing. There is NO escape from the research paper! However, your homeschooler can feel equipped and empowered to produce a powerful and interesting paper- and be ready to ace Freshman Composition when the time comes. What you need is no-busywork, friendly-toned research paper curriculum for high school. Research papers are a necessary of homeschool education. Young people need to be able to capture and organize ideas, communicate with written words, and create citations and reference pages. This 38-page downloadable pdf guide by Allison Thorp will lead your student through the research paper process from topic choice through final draft, culminating in an MLA style paper with proper citations. The process is broken down into manageable sections with lots of advice and direction for each. MLA Research Paper Writing Guide teaches necessary skills with no unnecessary busywork. Using this research paper curriculum for high school with our own students and hundreds in our local homeschool community over the years, we have seen success with writers of every variety. From those who love to write, to those who cry, “I don’t know know what to write!” Allison’s friendly, easy-to-follow steps of instruction and the manageable pieces into which she breaks the research writing process result in papers completed and students encouraged. There is no escape from the research paper, so give your homeschooler the tools for a successful research paper experience! Click here to view an excerpt from Research Paper Writing Guide.